Qatar has defeated four-time winners Japan in the final of the 2019 AFC Asian Cup football tournament at the Zayed Sports City Stadium in Abu Dhabi. Qatar’s Spanish coach Felix Sanchez said the tournament win was a “huge result” for the team. “Today we made history for our country, so we need to be very proud about our achievement,” he said after the match. Al Jazeera’s sports correspondent Lee Wellings, speaking from London, said the fact that Qatar has a competitive team will be a really good factor for the host nation at the World Cup. “To actually have a team to cheer for and get behind will give a positive feel to Qatar going into the 2022 tournament,” he said. Japan was chasing a record-extending fifth title. “Our goal was to win the title, and so I’m disappointed and regretful we could not bring the Cup home to the Japanese people,” Japan’s coach Hajime Moriyasu said. “We love our team, they are our heroes and they have kept our heads high. Celebrations are in full swing in Doha as Qatar are crowned Asian champions. This is the Gulf nation’s first major football tournament win. Qatar’s Emir Sheikh Tamim bin Hamad Al Thani congratulated his country’s football team for an “historic victory”. “A tribute to our heroes who made this tournament an Arab achievement and… realised the dreams of millions of Qatari football fans across the great Arab world,” Sheikh Tamim wrote on his personal Twitter account. Qatar’s national football team has defeated Japan 3-1 in the final to lift its first Asian Cup title. Qatar’s Akram Afif converts the penalty kick to put his side 3-1 ahead. He receives a yellow card for taking his shirt off to celebrate. Japan’s Takumi Minamino scores the first goal for his side in the 69th minute. Japan’s Yoshinori Muto comes in for Genki Haraguchi. Abdelaziz Hatim scores the second goal for the Maroons in the 27th minute. Qatar takes the lead with 22-year-old Almoez Ali scoring in the 12th minute. This is Ali’s ninth goal of the tournament, he has broken the record for the most goals scored in a single edition of the competition. The Asian Football Confederation (AFC) has dismissed the protest lodged by the United Arab Emirates Football Association over the eligibility of two of Qatar’s players, the body said in a statement ahead of the final on Friday. The complaint about Qatar’s Almoez Ali, a 22-year-old striker born in Sudan, and Bassam Al Rawi, a 21-year-old defender born in Iraq, was reportedly filed within two hours of Qatar’s 4-0 victory over the UAE on Wednesday. Japan remain the clear favourites, ranked third in Asia and having put through a commendable performance in the 2018 World Cup. They are ranked 43 places above Qatar. But Qatar have scored 16 goals in this tournament without conceding any and have beaten teams ranked well above them. An Al Jazeera English poll carried out on Twitter says fans are equally divided on who will win. 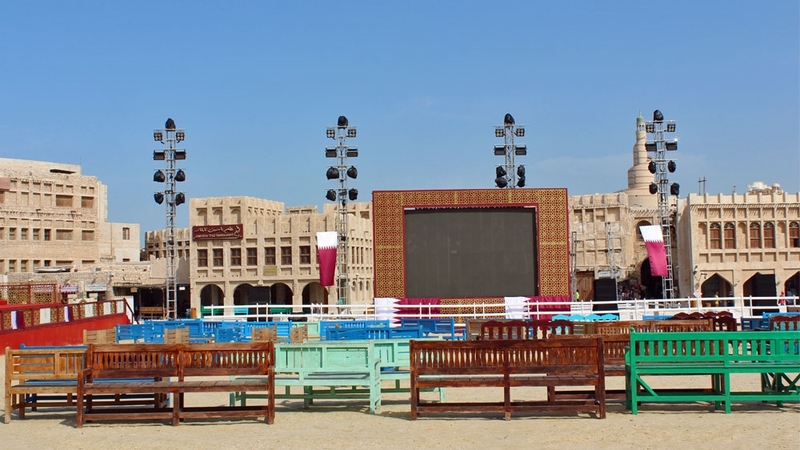 Big screens have been set up around Qatar for fans to watch the final as they were unable to travel to the match in person because of a regional blockade by the UAE, Saudi Arabia, Bahrain and Egypt. Special TV screenings will take place at around the capital Doha, including Souq Waqif and Katara Cultural Village as well as restaurants, malls and hotels. Qatar’s coach Felix Sanchez believes his players are ready for one final push that can land them the title. “The players are determined to get the victory we want by putting in one more huge effort against Japan so that we can make the Qatari people happy once again and make history,” said Sanchez. The air, land and sea blockade forced the team to take a circuitous route to reach Abu Dhabi from Qatar. 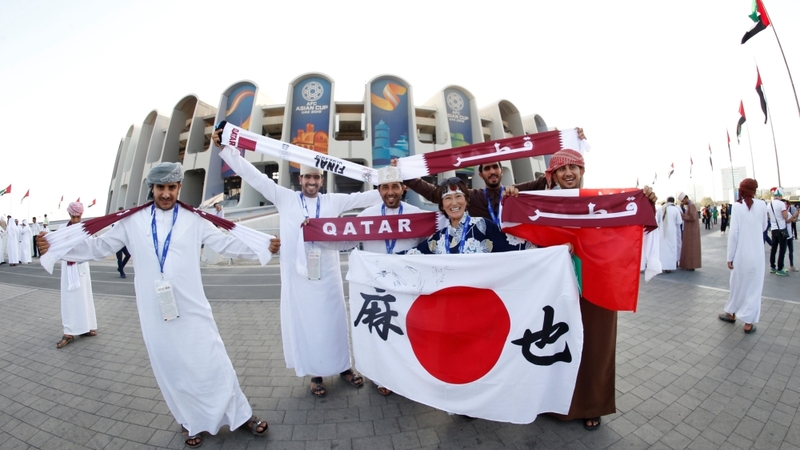 Qatari fans were not allowed to travel to the UAE to support the team. 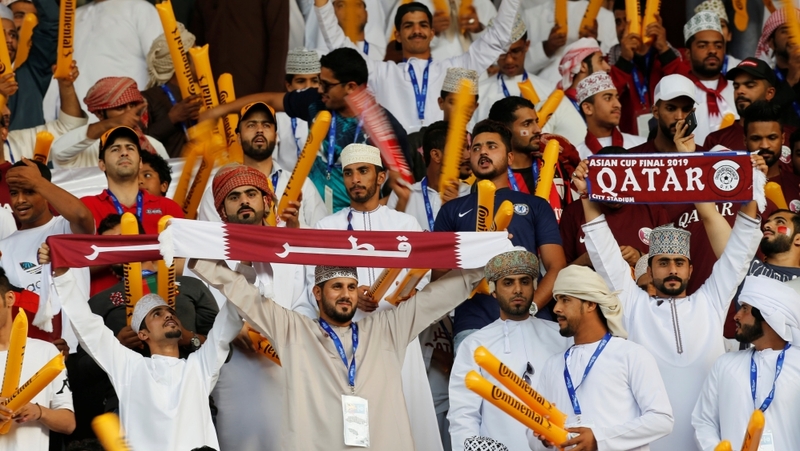 At some games, Omanis were in the stands, cheering on the Qatari players. During the semi-final against the UAE team shoes and sandals were thrown at the Qatari players from the stands. For the fans back home, Qatar are already winners. Read the match preview by Saba Aziz here.